This post is courtesy of our blog contributor Carolyn…I come from a long line of people who are great in the kitchen but in the past I never took the time to learn how they do it! Now I love to cook and bake so I am pretty much teaching myself to cook with the help of the internet, the occasional call to my mom or dad for advice, and cookbooks. 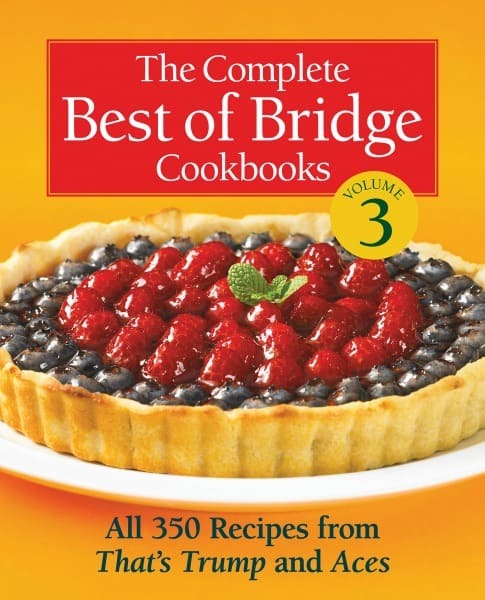 The Complete Best of Bridge Cookbook: Volume Three is a compilation of two prior cookbooks from my mother’s generation and claims “simple recipes with gourmet results”! Not only are the recipes simple and easy to follow, there are witty comments with each recipe that kept me smiling! I acquired this cookbook just in time because tis’ the season for home cooking easy yet hearty meals and baking yummy treats! Volume Three has a recipe for every taste, from sweet to spicy. My favorite was the Fettuccine with Asparagus and Shrimp, you’ll hear more about it later as I share some Best of Bridge recipes with you. I chose three specific recipes to try for three very different reasons! 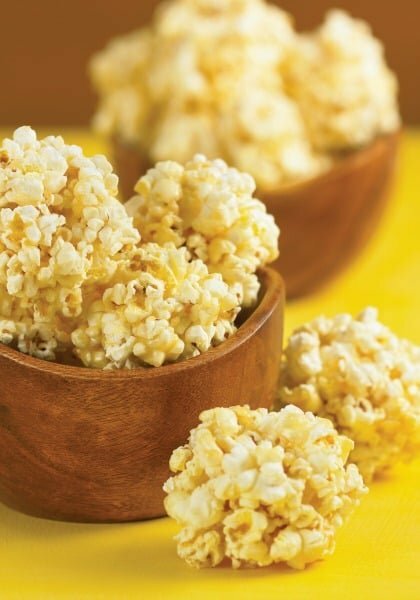 The first I chose, E-Z Popcorn Balls (P.42), could be a holiday treat and was definitely one of my favorites as a child! For me, making them wasn’t so easy! As a novice baker I had no clue where to start, luckily the recipe was clear but I felt I needed more detail. There is a small window between when the sticky liquid was too hot to handle (I burned my finger) and too hard to form the balls. As a first time popcorn ball maker I was unsuccessful in making the whole batch. On a different note, I did manage to make about eight and when my daycare children tried them they said they loved the sweetness and asked me to make more. So if you have any suggestions on successfully making a whole batch of popcorn balls, please share your tips in the comments below. Author: The Complete Best of Bridge Cookbooks, Volume 3 by The Best of Bridge Ladies © 2013 www.robertrose.ca Reprinted with publisher permission. Easy to prepare snack that kids & adults of all ages will enjoy! Boil sugar, margarine, corn syrup and vanilla for 3 minutes. Pour over popcorn and form balls while still warm. 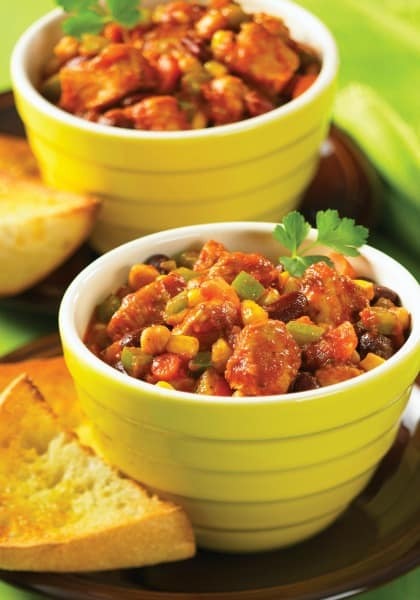 The second recipe I chose was Southwestern Chicken Chili (P.216). I chose it because nothing warms me up on a very cold winter day like a hearty meal and to me a big pot of various ingredients fills that void! I have never made chili with chicken before and was excited to try something new! Just below their forward at the beginning of the book, they say “The four food groups: Tasty, Fattening, Yummy, Celery”. This chili recipe has all four and it was delicious. Also, there was enough chili to feed two adults and a child for supper and again the next day for myself and the children in my care! Author: Courtesy: The Complete Best of Bridge Cookbooks, Volume 3 by The Best of Bridge Ladies © 2013 www.robertrose.ca Reprinted with publisher permission. A comfort food perfect on a cold winter day. In a Dutch oven, brown chicken in oil. Add onions and garlic and sauté until onions are soft. Add chili, cumin, oregano, coriander, salt and pepper. Add carrots, celery, tomatoes, tomato paste, lime juice and sugar to chicken mixture. Bring to boil, reduce to simmer, cover and cook for 1 hour. Add corn, kidney and garbanzo beans and green pepper. Below the forward in the beginning of the book , the Best of Bridge Ladies inform us that they hired dieticians to help them develop fat-reduced recipes and so I chose a recipe with a halo below the recipe. The halos tell you when the recipe has less than 15 grams of fat! Fettuccine with Asparagus and Shrimp was my favorite recipe of the three I made from The Complete Best of Bridge Volume Three and it was only 11.2 grams of fat per serving! The recipe was mostly fresh ingredients. The sweetness from the bell peppers, the mellow crunch from the asparagus, and the subtle heat from the chili flakes was enough flavor for the recipe, but the splash of soy sauce perfected the taste! A light but filling meal packed full of flavor. In a bowl, mix shrimp with lemon juice, hot pepper and salt. Heat oil and stir-fry onion, pepper strips and salt until peppers are tender-crisp; remove to bowl. In same skillet, heat oil and add asparagus and shrimp mixture. Stir-fry until asparagus are tender-crisp and shrimp turn opaque (about 3 minutes). Stir in pepper mixture and water; heat through. 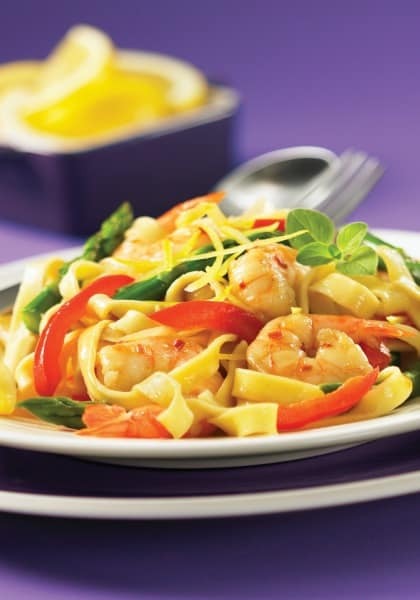 To serve, toss fettuccine with shrimp mixture and soy sauce. I am hoping to create a few of the other recipes from the cookbook in the next couple weekends. The One Cup of Everything Cookies would make a great gift for a neighbor and I think Cranberry Scones might be a Christmas morning hit! Want to purchase a copy for yourself, visit the RobertRose.ca site for current pricing and availability. Images & Recipes Courtesy: The Complete Best of Bridge Cookbooks, Volume 3 by The Best of Bridge Ladies © 2013 www.robertrose.ca Reprinted with publisher permission. For more delicious recipe, visit our Recipe page and follow us on Facebook, Twitter, Pinterest and Bloglovin’. *Disclosure: I received a copy of this cookbook in exchange for my honest review. All opinions expressed here are my own.